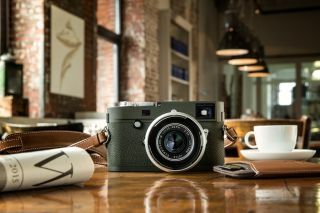 Leica is going green with the introduction of an olive-colored verion of its M10-P rangefinder camera. Only 1500 of the special edition camera will be made... but there will also be the option of buying one of just 500 green versions of its Summicron-M 50mm f/2 to go with it. These are the latest in a long line of 'Safari' editions of Leica cameras, which were originally produced for use by the armed forces in the 1960s. These have since become highly- sought after by collectors. The first 'Safari' edition made for consumer use was the Leica R3, which went on sale in 1977. Last year, the company produced a Khaki edition of the Leica Q camera. The Leica Summicron M 50mm f/2 Edition 'Safari' is the first ever M-mount lens to be made in the signature olive color. The camera comes carrying strap and case for SD memory cards and credit cards crafted from brandy-coloured, full-grain cowhide. The Leica M10-P ‘Safari’ Edition’s olive body contrasts with the silver controls. The Leica M10-P Edition ‘Safari’ body is priced at £6,900, while the Leica Summicron-M 50mm f/2 Edition ‘Safari’ lens will retail at £2,300 when it goes on sale from February 15.